Ha! It’s not that I’m opposed to the mixes – especially when it comes to ranch and potatoes because they go together like Bert and Ernie! – I was just pointing out that we don’t need them every time we cook a roast. 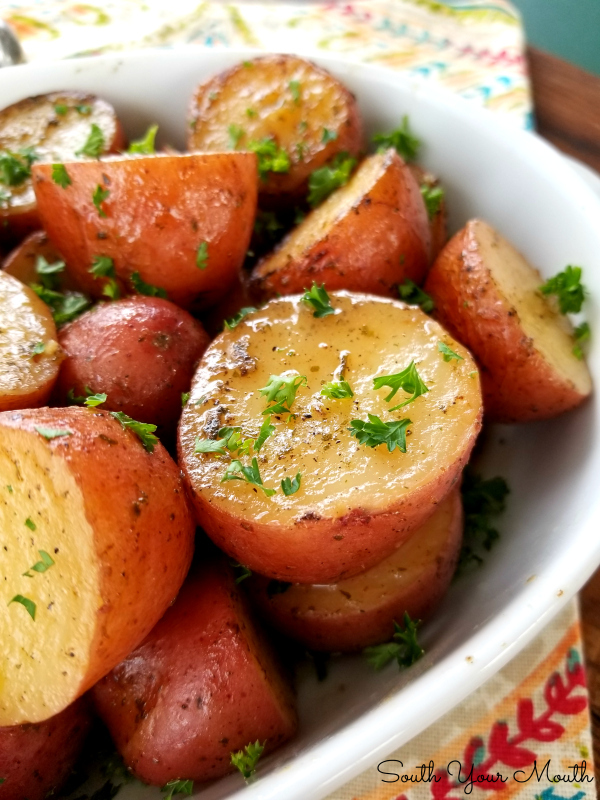 I was going to cook the potatoes in the crock pot with my roast but that sucker was huge so that wasn’t going to work. I pulled out my smaller crock pot and though meh, just cook the potatoes by themselves. 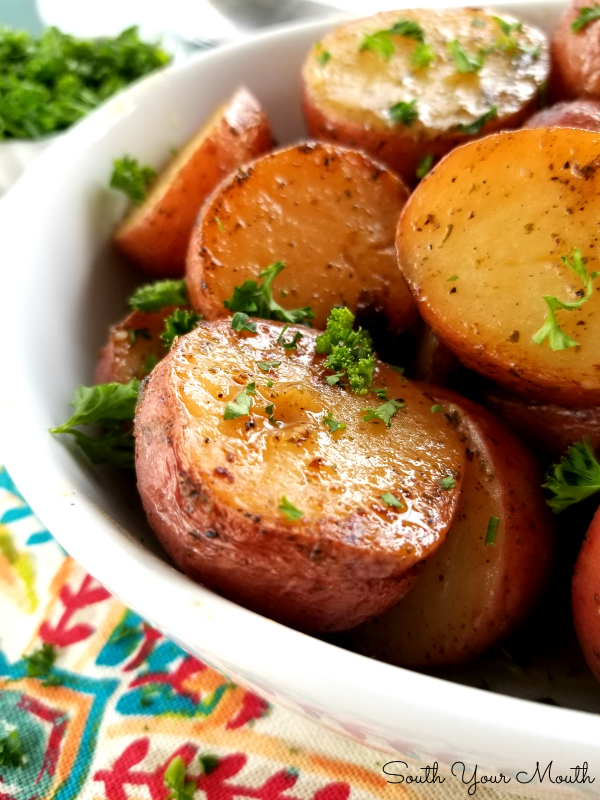 I’ve seen people make “baked potatoes” in their slow cookers so I figured what the heck! I couldn’t get over how they actually roasted! Like, with browned bits and everything! They were as tender as butter on the inside and the skin was silky and delicious! I thought about using butter instead of olive oil but I knew the butter would separate so I didn’t (though you totally could). Plus I LOVE olive oil with potatoes. Ranch and potatoes and olive oil go together like Bert and Ernie AND Big Bird. Now, since I didn’t elaborate when I posted the melt-your-face-off-good slow cooker pork roast the other day, I guess I should explain what happened with the squirrel… I almost ruined my roast when I got distracted by squirrel with a hat. And a sword. Well, that’s what I thought I was seeing. I glanced outside to see a squirrel running through my yard with a knitting needle wearing what looked like a hat trying to get away from our 20-lb yard cat, Ricky Bobby (or when he’s bad, it’s just 'Richard'). Upon further inspection, I saw that the squirrel was on the lam with a wad of yarn which still had a knitting needle attached to it. The way he was toting it (I swear he had it slung on his back somehow) looked like he had on a hat and was wielding that needle like a Scottish broadsword. That image must be why I thought I heard him shout in his best William Wallace (a la Mel Gibson) Scottish brogue, You’ll never take our frrrrrreedom!! as he cleared the fence. I was genuinely pleased with these spuds! I will absolutely be making these the next time we have company over. One less thing to think about when I’m preparing a big meal is my kind of plan! I think they would be dynamite with grilled steak, BBQ chicken, pork or beef roasts or any sort of steamed or grilled seafood! I think they would be great with these recipes I found for Oven Roasted Garlic Pork Chops and Crock Pot Meatloaf too! Wash potatoes then dry with a kitchen towel or just leave them out a bit to dry on their own (we don’t want them wet when we add the other ingredients). 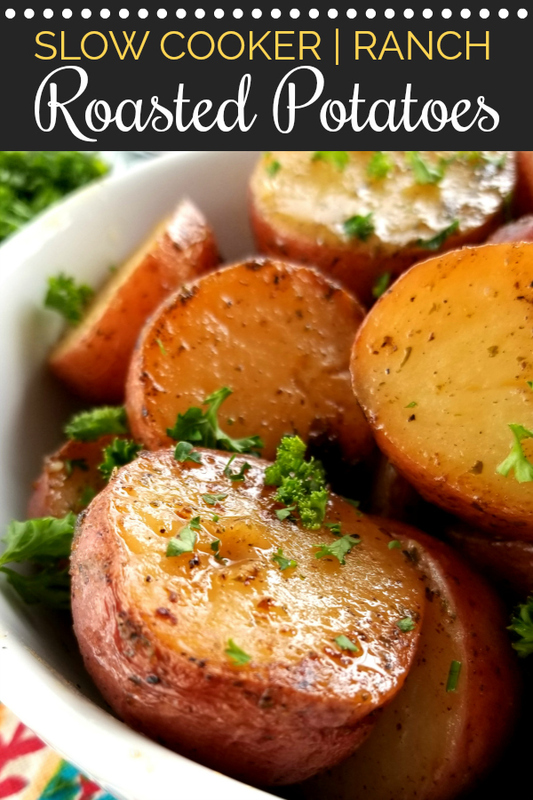 Cut potatoes in half (leave the small ones whole – you want all of the pieces and potatoes to be relatively the same size). 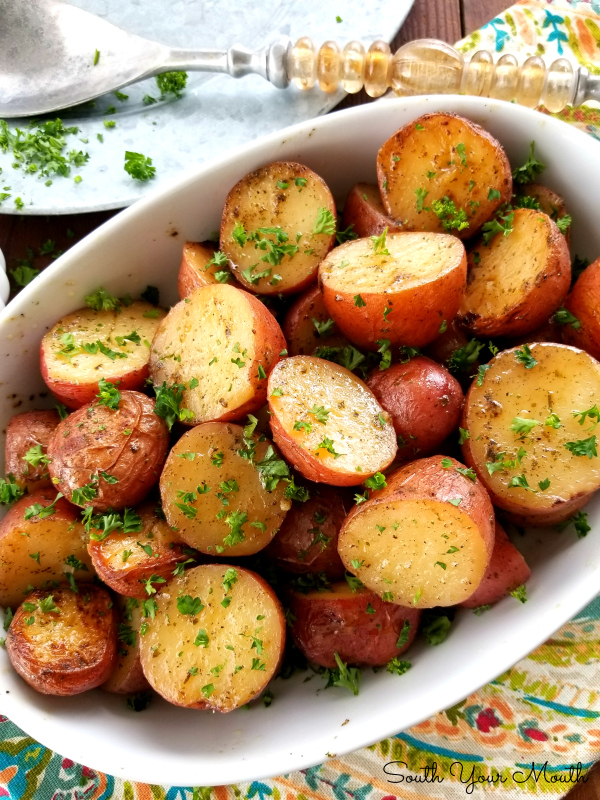 Add potatoes to a mixing bowl. Add ranch dressing mix, salt, pepper and olive oil to the bowl then gently mix until all ingredients are combined. Spray a crock pot with cooking spray (or rub with butter) then pour potatoes into crock pot. Using a spoon or rubber spatula, scrape out every last bit of seasoned oil to add to the potatoes. Cover then cook on Low for 6 hours, High for 4 hours or until potatoes are fork-tender. Gently stir once or twice during cooking. 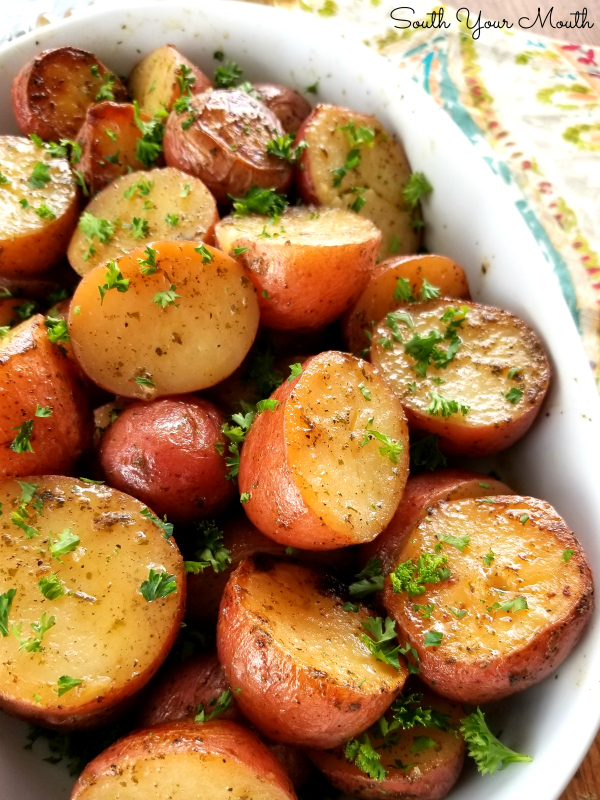 When ready to serve, stir in parsley then remove potatoes to a serving bowl. Drizzle cooking liquid from the crock pot over the potatoes. 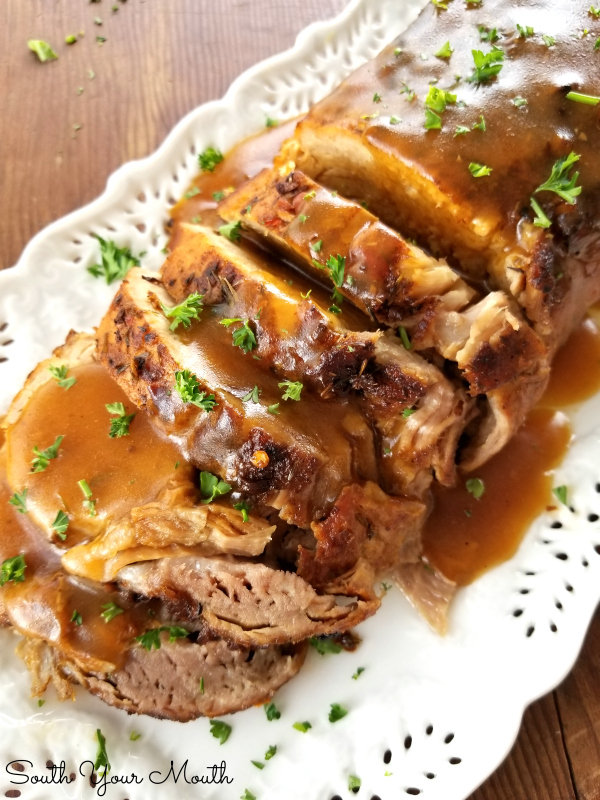 Here's the recipe for the pork roast! Oh wow, this looks so delicious! The photos alone had me convinced on trying this recipe! 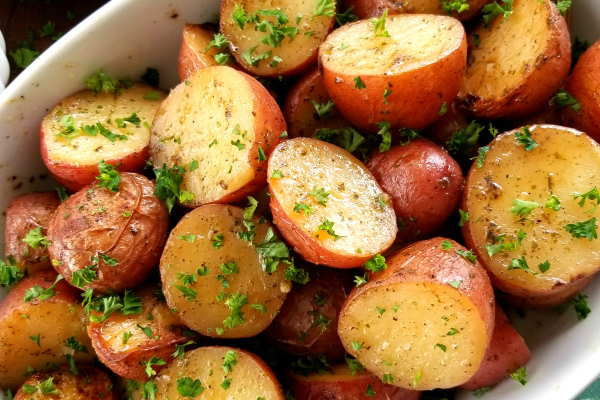 Any way to adapt this with Idaho potatoes? Can i just cut them smaller?